In May of 2015 we began installation of a 50KW project for ACTR. Their new Community Transportation Center had been designed with solar in mind. 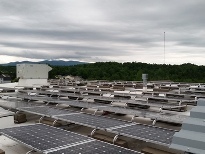 DC Energy was able to make maximum use of the available roof space to offer ACTR a project that could offset all of their current electric usage. This will help ACTR stabilize their cost of energy and enable them to better serve the mass transit needs of Addison County.